I discovered this extraordinary drink last year. 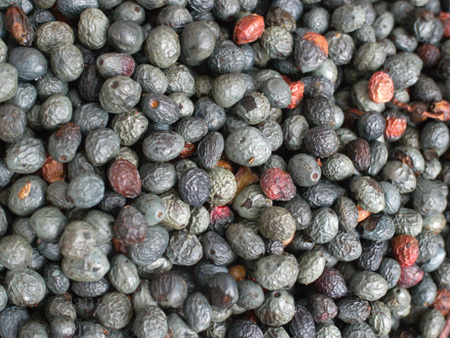 I was walking through the bazaars of Gaziantep (or Antep as the Turks like to call it or ‘Entab as the Syrians do, a lovely town in south eastern Turkey which is a mini Aleppo, complete with a smaller Citadel) when I stopped in front of a sack full of pretty small dried berries, some blueish and some red which I had never seen before. I asked the vendor what they were but naturally, he only spoke Turkish and sadly, I don’t. Rather annoying but I was meeting my friend Filiz Hosuokoglu, the reference in Gaziantep for all things culinary, and others — her father and brothers have a lovely gold jewellery shop where I got my lovely grape earrings — for lunch and I bought a bag to show her and ask about them. 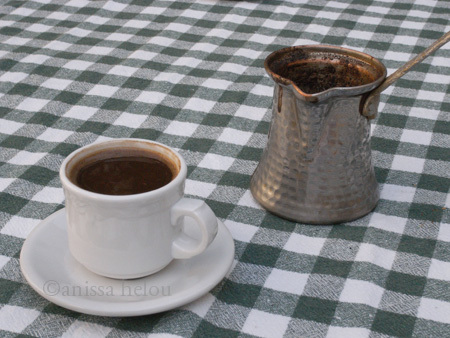 She explained that they were wild pistachios used to make a caffeine-free coffee that looks like Turkish coffee, but isn’t – it has a resinous quality to it and a mouth feel that is definitely an acquired taste. 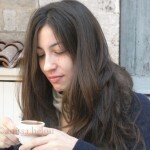 After lunch, Filiz took me to the most divine old-fashioned cafe, Tahmis, to taste menengiç. 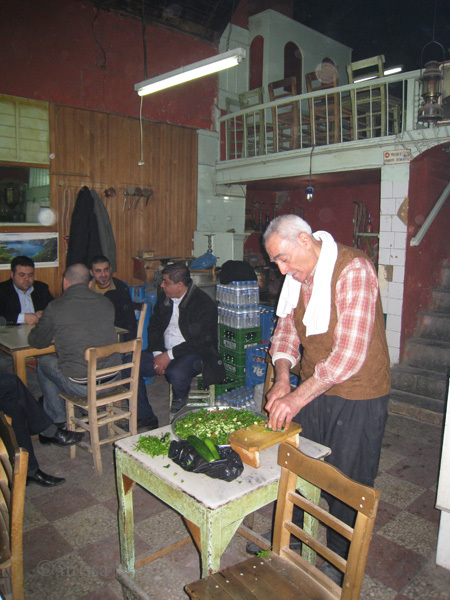 Sadly, the café is being restored now and the old man in the picture below will no longer run the café when it reopens. I was intrigued and I thought I would introduce my friends and students to it. What I omitted to do was ask Filiz how to use the berries I had bought. It wasn’t until I returned to London that I realised I couldn’t use them as they are. They needed to be processed and I couldn’t do it. 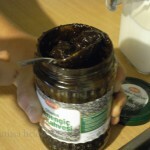 People buy menengiç ready-processed in jars or cans with the berries already roasted and crushed into a kind of dark, thick and wet substance. 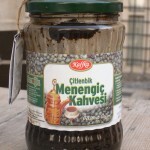 So, no menengiç coffee until I had a jar of the processed berries. Now, I am sure I could have bought one at any of the Turkish shops in Green Lanes, north from where I live, but it wasn’t the same thing as bringing one back from Gaziantep. Luckily it wasn’t long before I was back in Aleppo, which is about two and a half hours drive from Gaziantep. Once there, I hired a car with the most sullen driver ever and took along my lovely friend Anna (who is about to take a sip of menengiç in the last photograph). We stayed in the same boutique hotel where I normally stay, Anadolu Evleri, two lovely old houses in the old part of town, round the corner from the bazaars. Everyone there is charming, Tim who is the owner, his family and the staff; and they also are extremely helpful. As soon as I explained to Tim that I needed to find out more about menengiç, he brought out the jar you see in the picture below, and asked one of his lovely young men to make us some. Anna asked for hers to be made with milk while I had mine plain. To tell you the truth, neither one of us liked it much but it is definitely worth trying, at least once. Happy new year. The method is the same for both. Ideally you need a rakweh which is the Arabic name of the little pot with the long handle and spout in the picture above but you can easily make your coffee in a small saucepan. Measure out the number of coffee cups you would like to make by pouring water in a demi tasse (one cupful per person) and pour the water in the rakweh or saucepan. 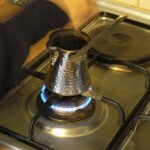 Add a heaping teaspoon of either very finely ground coffee (there are many good Lebanese brands with Najjar being one of the best known) or menengiç per each cup of water, and depending on how sweet you like your coffee, omit the sugar altogether (I always have it sadah, meaning without sugar; wassat means medium and helou, like my name, means sweet) or add up to a teaspoon per cup. Mix and place over a medium heat. Bring to the boil but be vigilant. The coffee will boil over, so, watch it closely as it starts rising and take off the heat just as it is about to boil over. Let the coffee settle, then boil again. If you like foam on your coffee, two or three boils will be enough. If not, boil several times until there is no more foam. The method is the same for menengiç except that you will not really have any foam. Enjoy. I live in East London and have done so for the last ten years but for some reason, I still go West for my Lebanese shopping. I could easily go North to the Turkish shops in Green lanes, and I do sometimes but Zeina in Moscow Road remains my favourite Lebanese shop, not only because they have the best and freshest produce and meat but also because they bring in all kinds of wonderful fruit and vegetables when they come into season. 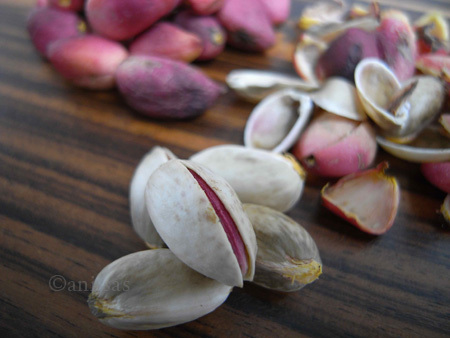 You remember the lovely fresh pistachios from a few posts back. Well, the pistachios are even better now. More mature with the shell more open and the nut plumper. 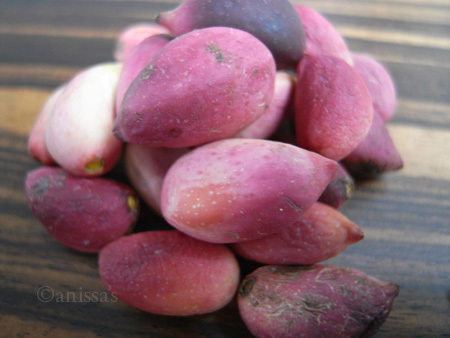 I have to add here that my friend Pierre Antaki, the secretary of the Académie Syrienne de la Gasstronomie, remonstrated wtih me for not mentioning that these pistachios were more than likely to have come from Aleppo (the name in Arabic is fistuq halab meaning the nut of Aleppo) where some of the world’s best pistachios come from. I had some friends over for a Lebanese dinner last night and as usual, I went to Zen on Moscow Road to do my shopping. It’s my favourite Lebanese shop in London, owned and run by three charming brothers who are incredibly friendly and attentive. It is very rare that I have to wait to get served there but this time it was different. There was a lady there, wearing the most impossibly high heels with mid-calf white leggings. She seemed to be a regular client and a flashy one at that judging by her fancy mercedes parked in front of the shop (as if her clothes did not give that away), and she was happily chatting away to Mario, the younger brother, while filling a large bag with fresh pistachios — the season is just starting. I kept making faces at him behind her back, not only to see if he could rush her but also to stop her from taking all the pistachios but she was going on and on, and Mario was too polite to say anything. I thought she would never stop. She did eventually and thankfully, she left some pistachios which I pounced on before someone else did. She paid and got into her mercedes, and I finished my shopping and went back home, tucking into my fresh pistachios on the tube, leaving some for my guests of course. They were all curious about them, having never seen fresh pistachios before and naturally, they loved them. 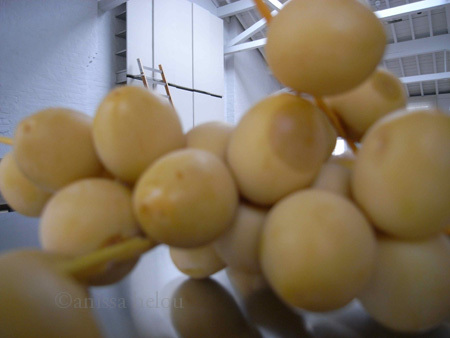 Apart from being great just as a snack or with drinks, they are also lovely added to a fruit compote or a fruit salad. The only problem with the latter is that if you are greedy like me, you won’t be able to stop eating them while shelling them. Totally irresistible. It’s not that I like gruesome foods that much. The ants I ate recently in Brazil were quite repulsive. The camel kebabs were OK although I am not rushing back to the camel butcher any time soon. As for the worms I had in South Africa, they were pretty boring. However, nothing I have seen is a patch on the penises I spotted for sale at a bovine butcher in Sao Paulo’s central market. The butcher said he sold them to Chinese people to cook in soup for medicinal purposes. He did say what the purpose was but I am going senile (sadly not prematurely any longer) and I forgot what the purpose was, but it wasn’t aphrodisiac. Anyone who knows, please write and tell me. There was nowhere I could go in the market to taste them but for anyone wanting to eat edible penises, here is where to go.